The two best months to buy home furniture is January and July. July is coming up so start researching the brands, styles and prices for that new couch, love seat, bedroom suite and whatever home furniture you need or want to replace. Then get your shopping shoes on when July hits. Why July? Makes sense when you think about it from the store’s point of view. Which shoppers always need to think about when shopping for the home. Summer months can be the deadest months for furniture stores so they have to make deals to get shoppers in the store. Dealing with furniture moving and furniture deliveries and decorating is a lot more appealing in good weather than in snowy, cold weather. New furniture models and designs will be released in August. Furniture stores need to get rid of yesterday’s models to open up showroom floor space for the new sets. That means making good deals and having sales specials. It’s been awhile since Christmas season and awhile to next Christmas so money could be burning in the pockets of shoppers without the guilt or fear. When it comes to home furniture shopping and purchasing, the options can be endless which is why it’s good to start the research now. Look up styles on the web then go to the varying stores to actually sit, touch and look up close to them. Oh, and make sure you measure the space you want to fill first. If it don’t fit then you need to quit. At least for that particular item. How about payments? You have four choices in how you want to pay. You can go cash, credit, rent to own or used. If you can’t go cash outright then look at your payment options to consider credit or rent to own stores. There is a time where credit is the way to go then there’s the time when rent to own is the way to go. Both have the same premise – the less payments, the less the cost so do the math on both transactions. Be wary of those stores that offer the 0% interest for the first year or you don’t have start making payments for a year or two. Because when that offer is up or payments begin, the interest rates most likely will be very expensive. If you go used, then make sure you test that furniture out really well. 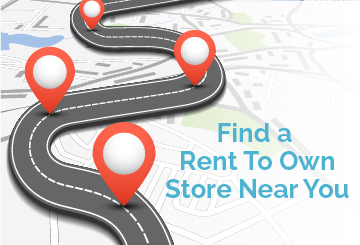 And, rent to own stores can be great for used deals. They need to have new furniture on the showroom floor so getting rid of used furniture is a priority. There’s also the showroom models. That exact furniture that customers have been testing out for the past month(s) in the store can be a steal of a deal especially during, well, you guessed it, July. Spring into Decorating for the season. Now that the spring season is officially here, here’s some home decorating tips to spring into your home. So, where do you start? Let’s see. Flowers and real plants. Time to got get a bunch of flowers and real plants to liven up the room. Nothing better in a celebration than flowers. And live plants are good for health and home. And it’s time to till the flower beds and vegetable gardens. Paint your door a different color and make it something bright. That’s a fairly easy task and can make a huge difference. It’s also good for the psyche. Studies show positive change in the daily routine stimulates neurons in the brain making you more happy. Thus changing the color of your front door that is pleasing provokes a happy feeling as it is new and is one of the first things you see when driving up to your home. Put the candles up for next fall. If you have been a staunch Shop RTO follower then you saw how candles make great winter decorations. It’s not winter so put them away and use the sunlight. Especially now that daylight savings time is here. Change your bedroom pillow and blanket covers. Make them bright, flowery, colorful, sunny, etc. And, most of all, hopefully retire that winter coat for awhile and enjoy some warmth and sunshine. Just another ShopRTO Home Decorating and Outdoor Decorating tip. ShopRTO provides consumers spring cleaning and living tips for the home and when rent to own is the right choice for your home furniture, appliances and electronics. Lights make for great Winter decorations. Holiday decorations are easy for outdoor decorating in the dark, bleak months of Winter but what about post-Christmas? Still need to keep the outdoors as fresh and pleasant as possible especially when the Winter blues are really weighing heavy. Two of the most prominent themes are evergreen and light. The latest trends have been the winter urns and night lanterns. There are all sorts of winter urn decorations using the combination of evergreen bushes. decorative branches that are laced with pine cones and colored beads. There are also many different kind of pots and urns to use that can be easily switched out according to seasons. And you can find those at any Lowes or Home Depot. And for the evening, lights are the best way to brighten up the front of your home and hopefully even your spirit. The lantern cases in the Winter is usually bright colors. Many are white especially in those areas of much snow. Strands of white lights are always good especially when aligned on a walkway so it looks winter decorative rather than being lazy and never taking down the Christmas lights. In the south, there are many decorative flowers that are hearty and beautiful. Pansies and violets can be the most vivid. And then there’s sweet pea, honeywort, calendula, sweet alyssum, jasmine and honeysuckle. But the best of the best outdoor winter decorations are snowmen and, if you’re really good, ice sculptures. But they won’t last that long unless you’re bunking with Santa in the North Pole. Just another ShopRTO Outdoor and Home Decorating tip. Halloween home decor? Just add pumpkins. There are many ways to skin a pumpkin. 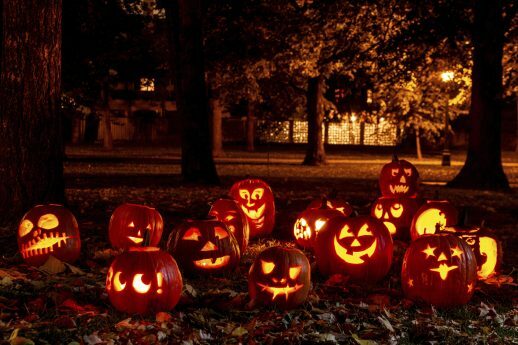 Pumpkins are the icon of the Halloween. So use them. There are so many ways to carve, draw or set them to make great decorations for the home. Here’s some quick ideas for this year’s Halloween home decor. If you want a more complicated Halloween face, use the many stencils out there to trace the more intricate designs on the pumpkin. Then use the tracing to carve out the design. Try stacking the pumpkins vertically. The designs are limitless. One example is to create a body made of pumpkins. Stack five vertically. Use the top as the face and the ones below as different designs for the body. You can go in all sorts of directions with that arrangement. From buttons, belly button, bikini, bowtie, etc. And each idea can either be cut for the design to be lit or drawn or using the actual items. Go the other way and place pumpkins in a horizontal line and design from there. One example is use the first pumpkin carved like Pac Man and smaller pumpkins as the dots proceeding. Drill them. Use a drill or something similar to drill holes that act as the outline. Creates a different design while still being dramatic with the flame or light shining through. Use letters. Carve in one letter per pumpkin and place them accordingly. Have three pumpkins for the word “boo” for instance. Accessorize. Use outside elements to add some flare. Use a hat, cigar, stick hands, arrow, etc. Carving pumpkins are now taking the shape of designing pumpkins and can be cheap and easy. Try a different design this year and use some other Halloween Shop RTO tips to make your Halloween as festive as possible. Just another Shop RTO Home Decorating and Holiday Tips. Use the right color schemes for your home. Before painting your home or picking out your furniture and appliances, you might want to understand the subconscious meanings behind the colors you choose. While many psychologists make sure to indicate that reaction to colors can be affected by prior experiences, there are general impacts to colors that affect the mood of a room. Green is the safest color as it symbolizes nature and has a calming feel. These are good for the bedrooms or reading rooms. Dark green can have a masculine feel associated with wealth. Yellow is the most cheerful and attention getting but can be overpowering. Babies will cry more in brightly yellow rooms for pete’s sake! So, be prudent with the yellow colors. Purple is a regal color reflecting wealth and prosperity and a feminine and romantic color. It can also be construed as artificial as it is the rarest color in nature. Brown is one of the most common color as it’s abundance on earth. Too much brown can connote a sad feel though. Blue is also a common color as it reflects water and the sky. It is also like green in the fact it has a calming effect. Red is the most emotionally intense color. Reflecting love and attention. Be careful with red and make sure to use it as an accent color. White reflects innocence and purity. It reflects light the best and is easy in decorating as it goes with everything. Too much white shows sterility which is why hospitals and staff mostly wear white. White is also the easiest to show wear and tear and dirt. It is best to be an accent as well. Black reflects power and authority. That’s why many authority figures dress in black clothes. Black can also connote villains so be careful unless you’re a bank robber or something. Too much of one color can be overpowering even if it’s the calming ones such as blue and green. Make sure to balance or accentuate properly. With these themes in mind, look at the rooms of your house and ask yourself what do you want that room to emanate. Begin with that premise then pick the proper colors for your home decorating. Just another Shop RTO home decorating tips. Will renting and rent to own gallery art for the home catch on? Painting by gallery artist Keith Davis. Renting and rent to own “high art” is nothing new. Galleries in L.A., Chicago and Seattle have been doing it successfully for years. Traditional rent to own stores have been renting to own art for decades. But, is now the time for gallery-level art to hit national distribution and demand? One company, GetArtUp, is testing the timing. The Y generation that is now coming into their independence have a higher sense of their standard of living that lends itself to a renters attitude. GetArtUp is the first (that ShopRTO knows of) that is taking the web to reach out to the country to help decorate homes with original art. Based out of San Francisco, GetUpArt feels good about their prospect with the launch “going well!”. They’re trying to keep the concept simple by offering art that is under $10,000 and at a standard $55 monthly rental. If the customer wants to own then 50% of their previous payments go towards ownership. The 50% formula is a little different to traditional rent to own that offers a 50% of the remaining payments towards ownership. GetArtUp also works as traditional rent to own where you’re never obligated to make the next payment and can return at any time for any reason. Renting art has always been a successful concept but never nationally at a gallery level. Renting home furniture and art gives consumers and decorators a great advantage of the “try before you buy” option especially when it comes to art. And swapping out art on a periodic basis gives a great decorating element of a fresh, new home each time a new piece is delivered. ShopRTO will be looking closely at this concept. If it works, it could create a whole new element to home decorating, access to gallery art and the image of renting and rent to own for the home. Painted oak furniture is trending in 2015. If there is a word for today’s furniture and decorating trends it would be “crazy fun”. Gone are the uniformity of design, color and theme on both furniture and decorating. Take the latest trend of mix and match furniture. Matching furniture is so yesterday. Some experts say it’s a matter of the Y gens being handed down furniture or not being able to buy all at once so made mix-match furniture hip and cool out of necessity. Nonetheless, matching furniture has been the norm so long that it’s time for something new. To add to the mix-match trend going on, there’s also the contrasting wall trend. It’s where your ceiling contrasts with the corresponding walls that then contrast with the floor below. The natural look is getting a paint job. Painted wooden tables, dressers and armoires are replacing the natural wood finish. The most popular type is oak. Blue is the color today. Any shade. Wallpaper is back. And with wallpaper, there are all kinds of directions you can go with patterns, colors and shapes. The most popular are the bold, ornate, textured and like said before, blue. So you combine the bold patterns of wall paper that contrasts with the adjacent wall of a different pattern that surrounds an array of mix and match furniture with a thematic blue then you get that “crazy fun” decorating trend that’s going on. So, go crazy and have fun and turn your house upside down with today’s hip trends.